JUNE 2000: I didn't take the original video footage, but I was given permission from Jill West and Blues Attack to utilize the video for educational purposes as a student at the Art Institute of Pittsburgh (AIP), and for usage on their original website, which I later created. I "captured" a few minutes of video in the Media 100 Lab at AIP, which converted the videotape to digital files. This process took many hours back in the year 2000. Today, there would be no need to "convert" video files because they would already be in a digital format. I edited the digital video files in Adobe Premiere using a variety of special effects to create this short video. JUNE 2001: This project was created for a class in Digital Video Editing back when I was a student at the Art Institute of Pittsburgh. I "captured" footage from the James Bond movie, GOLDFINGER, using the Media 100 Lab at school. Then I edited the digital video clips in Adobe AferEffects. The assignment was to create a "promotional" video for a movie, and to include a control panel that would appear in the DVD version. surrounding the WOMAN IN GOLD PAINT! Claim: The actress who portrayed Jill Masterson in the James Bond film Goldfinger died from asphyxiation after being covered with gold paint. Synopsis: In Goldfinger, after secretary Jill Masterson betrays her boss, the evil Auric Goldfinger, he kills her in style by painting her entire body gold. As James Bond explains when Masterson's body is discovered, covering a person with paint will cause death because the body "breathes" through the skin. He then goes on to state that professional dancers know to leave a small patch of unpainted skin at the base of the spine to prevent their falling victim to asphyxiation. Although it was still widely believed at the time Goldfinger was made (1964) that we "breathe" through our skin and that closing off all the pores in one's body would result in a quick death, we now know this to be false. (Another commonly accepted part of this concept was the notion that leaving a small portion of the body unpainted was sufficient to ward off disaster.) As long as a person can breathe through his mouth and/or nose, he will not die of asphyxiation, no matter how much of his body is covered with paint (or any other substance). This isn't to say that painting yourself isn't unsafe, however -- clogging all your pores prevents you from perspiring and could eventually cause you to die from overheating, and toxic substances found in paint could contribute to your demise if you stay in a painted state too long. 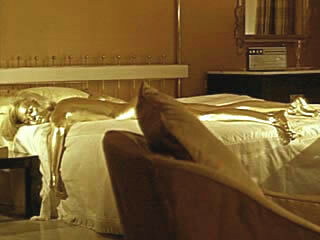 GOLDFINGER Pics For The Fans! *Click on images to view enlargements.